How do you take a Mustang from stock to super-powered? This winter, we took our ’05 Legend Lime V6 on the road to Swarr Automotive in Collegeville, PA. The mission was simple–to add more horsepower and style to the bone-stock ‘Stang (and boy, did we ever; just wait until you see the final numbers!). We’re releasing the super cool 4-part project videos on April 6th, but we’re awesome, so we have a sneak peak video to keep you salivating ’til then. Guess which mods we’re using, and you could win a $50 AmericanMuscle.com gift card! The first two people with the most correct, specific (saying ‘CAI!’ isn’t quite specific enough) guesses will each win a $50 AmericanMuscle.com gift card and a wicked cool AM t-shirt. That’s a heck of a prize for just guessing! All you have to do is watch the video below, and leave a comment on this blog entry letting us know which Mustang mod you think we’ve made. If you’re the first person to make the most correct guesses, you win. It really is that easy, so watch the video and let us know what your best guess is! Guess the Mods, Win $50! Watch the video, then leave a comment on this blog entry letting us know what mods you think we used in each of the following categories: Performance, Wheels & Tires, Lighting & Decals, Styling Accessories, and Added Boost. The first two people with the most correct, specific guesses will each win a $50 AmericanMuscle.com gift card and a sweet AM t-shirt. You can submit multiple guesses, but don’t spam the same entry multiple times. In the event of a tie, the first correct entry (by comment timestamps) will be the winner. All guesses must be submitted before midnight on April 5th, 2010. This contest is open to any US citizen, no previous purchase from AmericanMuscle is required to play. You watched the video, now give us your best guess. Winners will be announced on the blog Tuesday, April 6th. We’ll be launching our project videos the same day, so you can check to see how well you did. Make sure you stay tuned, things can only get cooler from here! OK, Here’s what I think is on this mustang. JLT Cold Air Intake Kit, Dual Exhaust Conversion Kit, Zex Wet Nitrous System, SR Wheels with Sumitomo Tires, Smoked Headlights with CCFL Halo, Smoked Tail Lights, Quarter Window Louvers, Short antenna, and black decklid panel. Pypes 409 Stainless Steel V6 Dual Pipe Conversion Kit; im pretty sure yall all r gonna do a full dual exhaust and not leave it to a Y pipe, most likely also a combination of a BBK cold air intake system, and a bbk Throttle body more air means more power, wit tires and wheels proably some sick looking GT4 wheels in black on some 275-40-18 in the rear n some 255-45-18 in the front, as for decals some black Lemans stripes wit an awesome “AMERICAN MUSCLE” windshield banner ;), u can do nething with accessories you can pretty much do nething from billet interior to some awesome Gauges and added boost well an awesome vortech supercharger kit wil finish it off! I have a V6 so I know the amount of money and work required to make some decent power out of them. Love what you guys did here. Heres my guess for mods. 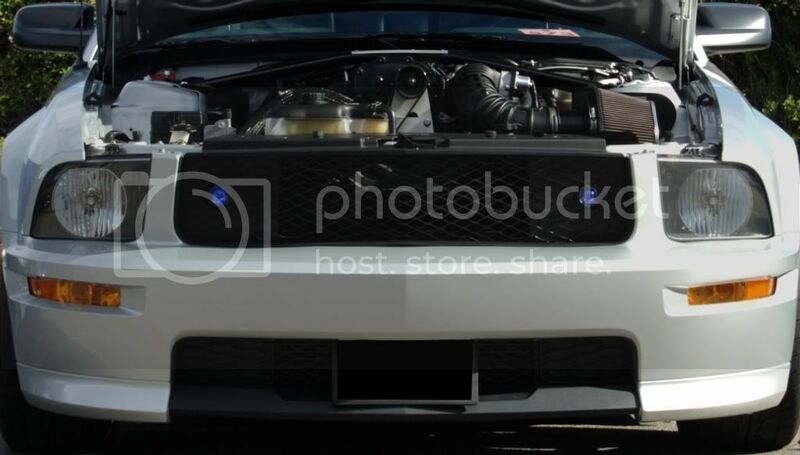 JLT 2005-2009 Mustang V6 Cold Air Intake & SCT SF3 Custom Tuner Combo Kit w/ Bama tune. That car will be amazing!! Can’t wait to see how it comes out! American Muscle rocks!!!! That car will be amazing!! Can’t wait to see how it comes out! American Muscle rocks!! And I’ll bet you finished out that intake with a BBK 70mm V6 Throttle Body. 16.) Eibach Pro-Kit Springs (05-09 V6) or one of the other brand’s but its lowered. 50.) Ford Racing FR500C Steering Wheel or another brand/ type. P.S. This is possibly anything that you could of put in that bad boy because most of that is all my dream thing for V6 Mustang. And I won! I can’t believe it! This is awesome and this is the best aftermarket mustang business in the world. I have an ’05 Mustang GT, and I got tired of getting my doors blown off by everything on the road. I dropped in an LS 376/515hp small block Chevy engine, and I haven’t lost a race since, street or drag strip! I have the best of both worlds- a Mustang with a Chevy engine! Really dude why would you say that. I bet when people ask you what you got under the hood and you say chevy the think you are stupid. You should have just modded the heck out of you gt engine it would have been faster and more exicting to do. But hey at least you have the body of a mustang. It’s simple, dude. I prefer the Mustang body to the Camaro. Nobody thinks it’s stupid when all they see is my tailights! Any moron can bolt on parts, how many people can swap in a completely different engine and make it work properly? Not many, I’d wager! Jordan, any time you want to run me for money, just say the word. You’ll be the one looking stoopid. Ok so your saying that my 1967 Fastback with a Ford RacingBig block producing 580 rwhp and 600 tourque with t-lock and much much more. Could race agianst your so called “GT”for money, well i would be tempted to do that. Why dont you stay in your Small Block Class and when you get the balls to drop a big block in your gt that from ford racing then you will know how it feels to go fast until then have a nice day beating street cars. You just dont drop a chevy engine into a ford or the either way it just makes you look stupied. How intelligent do you think someone looks when they display a profound inability to spell or punctuate properly? Maybe I will stay in my “Small Block Class” and upgrade to a Chevy LS9 engine with 638 HP and 604 ft. lbs. of torque. Unlike your “Ford Racing Big Block” specialty engine, it’s the standard production line engine in the ZR1 Corvette. Or, as you suggest, I could drop in a big block- a Chevy ZZ572/720R. That’s the crate engine with 720 HP and 685 ft. lbs. of torque. That’s quite an improvement over Ford’s M6007 with 521 cubes and 609 HP. The Ford’s corrected HP is 580 (5% less), so the Chevy’s corrected HP would be about 684. That’s a bit of a difference, isn’t it, Jordan? So the LS9’s corrected HP would be roughly 606. And 606 is more than 580. Given these facts, Jordan, why would you insult a small block Chevy?? Also, the small block weighs much less, so it possibly increases my power to weight ratio, and definitely improves handling. BTW, I’m sure you’re wondering- I got a great deal on my Mustang GT because the engine was shot, and I got a good deal on the Chevy engine because the owner lost interest in a project car. I had the desire and ability to build something different, so I did. A few friends helped. Maybe I’ll see you at AM’s Mustang show, Jordan. I hear Rt. 202 has a few good straight stretches of highway. Bring cash. A lot. Smoked Mustang Headlight w/ CCFL Halo (05-09). some sweet parts i wish i had to money to buy right now……..
Emily, you’re hurting our feelings, haha! shown in the video, i’m not sure whether we are supposed to guess these mods as well. to give it some sound i am sure you have some BBK shorty headers along with the pypes true-dual conversion setup with X-pipe and there street-pro mufflers. with painted GT rear valance, also painted rear quarter window louvers. GT spoiler, painted hood scoop, also added some hood pins, black billitt fuel cap. Rolling on some 20 inch black shelby racing wheels. i am almost positive they are wrapped in Nitto NT555 extreme tires. possibly lowered with some Eibach pro srings. Whether i am right and whether i win or not that is one amazing ride and i would have no problem driving it. I would just like to add that it appears the headlights are the Smoked 2010 Style Headlights for the 05-09 model. I just realized it after looking at AMs new products.